A ping-pong-playing robot served up a hit at a top Tokyo tech fair Monday, while a barely-moving machine in the shape of a sloth aimed to provide a relaxing change of pace. 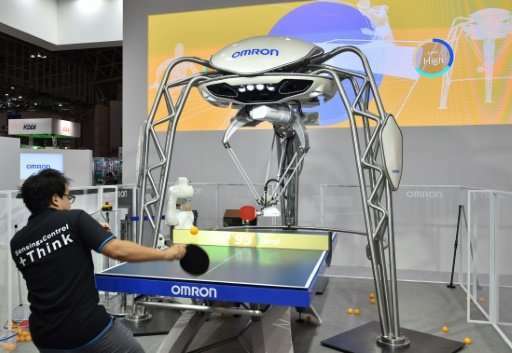 The alien-looking table-tennis star, named FORPHEUS, had a tough opponent, in the shape of Japan's first-ever Olympic singles medal-winner in a man-versus-machine clash. Technicians have worked on FORPHEUS's robotics and artificial intelligence technology and had hoped it would be able to return a smash from the Olympian, Jun Mizutani. "This machine now has the ability to react to a smash by observing the other player's movement," said Masayuki Koizumi in charge of sensing technology research at Omron, the robot's creator. "We hope people with advanced ping pong skills will play with the machine," he said. But Mizutani appeared to have little reason to hang up his bat yet, as the robot failed to retrieve his attacking shot. "One day it might hit back," Mizutani, 28, said after the match. Omron also showcased a new sensor that can detect whether a driver is concentrating or dozing off in a self-driving car. The company aims to commercialise its technology by 2020, it said at the Cutting-Edge IT & Electronics Comprehensive Exhibition (CEATEC) near Tokyo. Meanwhile, a new Tokyo start-up aims to help budding gymnasts and ballet dancers with a mirror that streams the movements of professional athletes. Using the augmented reality (AR) technology, would-be prima ballerinas can imitate the correct techniques when practising in front of the mirror by following the images of real experts. "You can consider it as a cyber coach," said Fujio Tamaki, founder of FunLife start-up, after demonstrating a pirouette by watching the teacher's moves in the mirror. "We hope we can provide professional skills that are not easy to access for the wider public—such as kids in remote areas," he said. But such professional coaching does not come cheap—the firm is renting the product for some 200,000 yen ($1,780) a month. For robot fans wanting a change of pace, toy maker Bandai showcased its new creation called "Norobo"—a combination of the words "noro" (slow) and "robot"— which comes in the shape of a panda or a sloth. A Norobo hangs from its arms on a tree-like bar, moving only 12 centimetres in eight hours. "Nowadays, technologies are too advanced and we're stressed out by using them," said Bandai's general manager Shingo Watanabe. "So why not create the world of slow robots?" Users can look at the sloth-like robot and just relax, he explained. The CEATEC, which exhibits the latest in consumer technology from nearly 670 firms, is open to the public from Tuesday to Friday.